What's the mom waiting for? 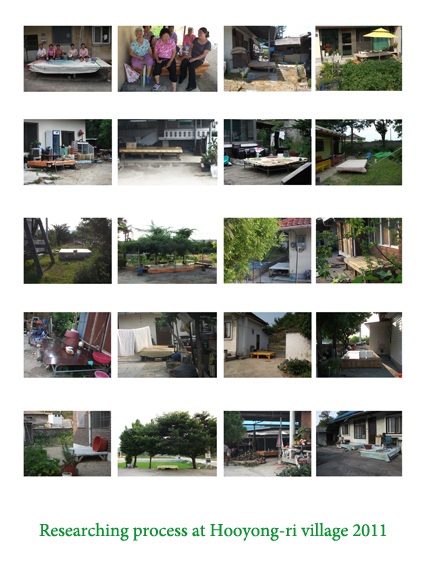 Representation: I complete research in Hooyongri village, a beautiful and quiet village with around 200 houses. Almost all of the people living in the village are old. Life here seems peaceful, people work on the farm and spend their spare time gathering in front of someone’s house to chat, play games, drink, and share food. Young, local people, have moved to big cities to study, work, and seek a better life. Adults have brought their children with them to the cities for a better education and better care for themselves and society. For these reasons, the village is very quiet without children or social activities. The schools are abandoned. Business and social offices apparently do not exist. My first visit the village was very nice. 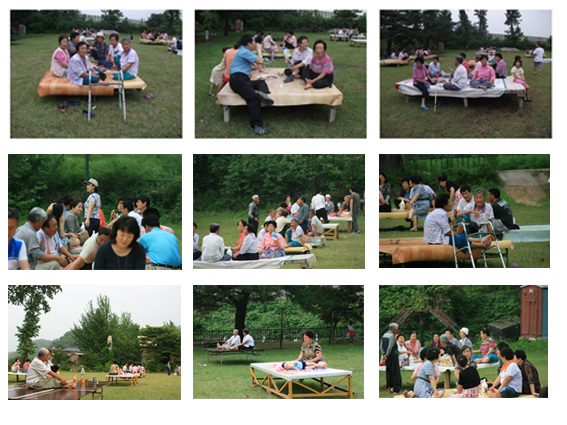 I met a group of grandmothers who were sitting on the “ Pyeong Sang” -- a big stage to welcome people and gather, usually put outside the house. They kindly invited me to share a drink and tried to communicate to me without language. 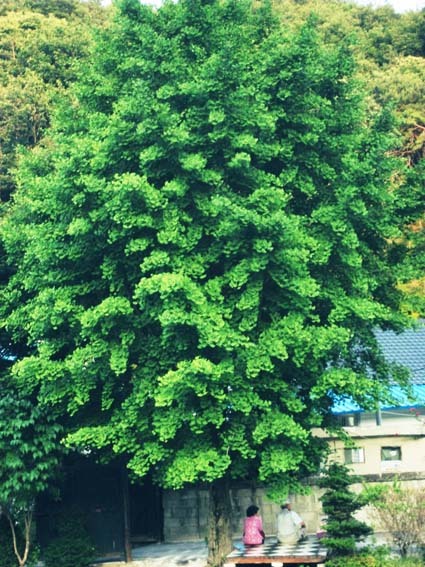 From my research, I wanted to understand and know more about “Pyeong Sang and public culture in Hooyongri village” today. What does it mean to meet on the Pyeong Sang? How do people share and think about it? How has it gone through their lives as a part of culture? 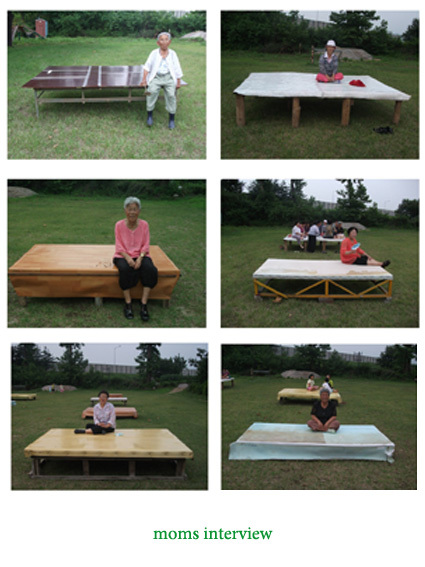 “What’s the mom waiting for?” project: I borrow nearly all of the “Pyeong Sang” (17) from the village people and install them in the big yard of Nottle, the space’s been a primary school before but now is transformed into a public space where artists come to live and practice art.Then, I invite the elderly women owners of the Pyeong Sangs to come and share their space and their lives on the stage. By showing the private, real life on a stage as a story, by drinking and eating, a problem is illuminated. In desiring a more comfortable life, we at the same time lose a part of our emotional backdrop. 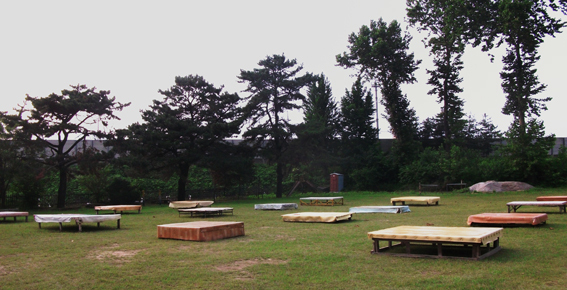 This project recreated the public space to remark on the environment we share together. Further, I wanted to reveal the hidden meaning behind the form of the work, to decode the substance of the movements of emigration, time, life, stories, images, and gatherings. The title of the work, “What’s the mom waiting for”, is a question for everyone who wants to examine the movements of both of the inner and outer worlds of existence.